A busy gathering place for students, staff and visitors from all over the world is not where you’d normally expect to find an exhibition of poster-poems. But if all those poems were bilingual, with many different languages represented, written originally by poets often famous in their own countries ? That might be quite an eloquent statement, quite apart from what the words themselves were saying. 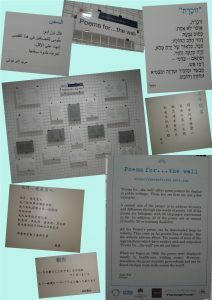 The collage of photographs here records a small exhibition of bilingual poem-posters that has recently been showing in a public setting managed by Bristol University. The exhibition went up under the stewardship of the university’s Bristol Poetry Institute. Half way up the collage, towards the left, you can see a background photograph of all the poems together displayed on the wall. Four of them are printed on paperboard at A3 size, the rest on card at A4 size. Although they are too small to be read here, it may be of interest to note that there are ten different languages represented in the group picture : Arabic, Dutch, Greek, Hebrew, Hungarian, Japanese, Latin, Mandarin, Punjabi, Tigrinyi. I have slightly enlarged five of the languages for this collage : Arabic, Hebrew, Japanese and two ages of Mandarin. One of the Mandarin pair – by Gu Cheng – was written approximately a thousand years after the other – by Li Bai. And the poem by Li Bai was almost certainly painted, not written. And when Li Bai positioned his letters, he started at the top and from the right and his eye ran downwards and leftwards. By the time Gu Cheng was writing, a thousand years later, he saw his writing in the same way as the westerner does – horizontally and rightwards from a margin on the left. And for those Westerners who don’t know, please note that the Arabic and the Hebrew you can see in the picture above here are both written and read from the right.